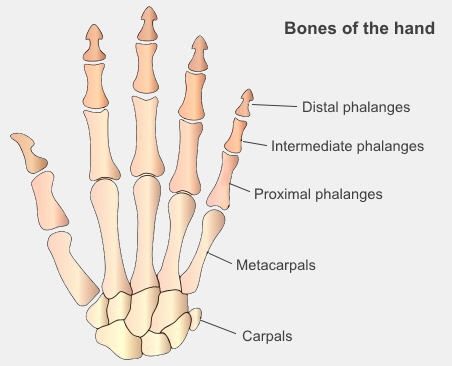 Each of your fingers has three bones, called the proximal, intermediate, and distal phalanges. Your thumb has only two bones, the proximal and distal phalanges. Although these bones are small, a broken (fractured) finger is not a minor injury. The bones in your hand line up precisely, and this is what makes it possible to do many delicate movements, such as holding a pen or manipulating small objects. When you break a bone in your finger, it can affect your ability to use your hand. If you don't get it treated, the finger can stay stiff and painful. A broken finger usually happens as a result of a hand injury – for example, when you slam your fingers in a door, put your hand out to break a fall, or when your finger jams when you're trying to catch a ball. It can also result from an accident when you're working with tools. Sometimes you can break and dislocate one of your finger joints at the same time. This can be a particularly nasty injury. How do I know if I have broken a finger? your injured finger will be out of shape (deformed). If you think you have broken a finger, it's important see a doctor, nurse practitioner, or hand physiotherapist. They will ask questions about how you injured your finger, examine your hand, and send you for an X-ray, to find out which bone is broken, and how it is broken. Bones can break in several ways: straight across, in a spiral, or into several pieces. They can also shatter completely. You may have X-rays of both hands, to compare your injured finger to the uninjured finger of your other hand. How is a broken finger treated? How your finger is treated will depend on what the break looks like. Most breaks are simple breaks, with the ends of the two pieces of bone still together. These are usually treated without surgery (often called non-operative management). In these cases, your finger is likely to be splinted or strapped to an another finger to provide extra support (this is often called buddy strapping). There are some things you can do to help your recovery, whether or not you are having surgery. If you are a smoker, stop smoking. Continuing to smoke will slow down how quickly you heal. Take regular pain relief. The best pain relief is paracetamol (Panadol) or paracetamol and codeine (Panadeine). Take two tablets every four hours, but no more than eight tablets a day. Avoid anti-inflammatories, as they may slow down how quickly your bones heal. as the pain gets better, start doing these gentle hand exercises, especially numbers three and four. Written by HealthInfo clinical advisers. Endorsed by orthopaedic surgeon, Canterbury DHB. Page created January 2017.
eMedicineHealth – Broken finger, retrieved January 2017. OrthoInfo – Finger fractures, retrieved January 2017.